UPDATE: Vigneault announced that Antti Raanta will start in net, Rick Nash will miss second consecutive game, and Dan Boyle is in for Dylan McIlrath. Following a 2-1 win in Colorado last night, the Rangers (9-2-2) play the second half of yet another back-to-back fixture, heading to Glendale to take on the Arizona Coyotes (6-5-1) for the second and final time this season. The Rangers came away with a 2-1 victory over the Avalanche yesterday, securing their fourth straight win and giving them points in each of their last eight games (6-0-2). Derek Stepan and Oscar Lindberg scored 21 seconds apart and Henrik Lundqvist made 29 saves. New York also came away with a victory the last time these two teams faced off, a 4-1 win at Madison Square Garden. 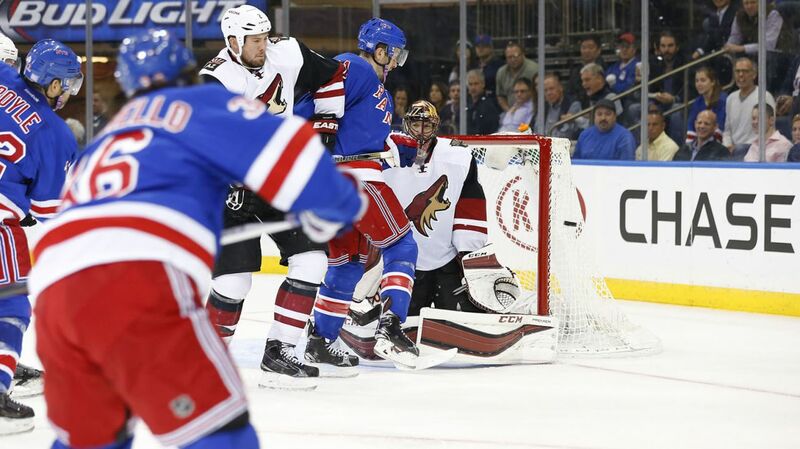 Arizona defenseman Klas Dahlbeck scored the first goal, but the Blueshirts fired back with four unanswered goals, including two in the third period from Kevin Hayes and former Coyote Keith Yandle. The Rangers have won four consecutive games against the Coyotes, which includes their last visit to Arizona; a 5-1 win with goals from five different Rangers and a point from 11 skaters. Most of the attention will be on rookie center Max Domi, one of the best first year players in the NHL. Domi’s five goals and 11 points are second among all rookies, while his six assists are third. He’ll center one of the top two lines and is always a threat to score. Anthony Duclair has been held pointless in the last six games, but he could be primed for a goal against his former team. Martin Hanzal is tied with five other players for second most assists in the league (12). Mike Smith is expected to start for Arizona tonight. Smith is very inconsistent, having stretches of fantastic play and then following that up with a few rough nights. He made 26 saves on 28 shots in the Coyotes last game, a win over Colorado, improving his record to 5-3-1. He’s posted a GAA of 3.03 and a save percentage of .904. Henrik Lundqvist hasn’t had a ton of work lately, so my guess would be that he starts tonight. Henrik has posted a .941 save percentage over the last 10 games, playing some fantastic hockey and singlehandedly stealing games away for New York. His .945 save percentage is the best in the league, his 1.80 GAA is good enough for third, and he’s tied for the league lead in wins with seven. If Lundqvist doesn’t start, Vigneult would turn to Antti Raanta. Raanta is 2-0-0, allowing one goal total in both of his starts. Kevin Hayes continues to play well and collect points, creeping up the leaderboards with three goals and six assists. He’s been much more comfortable and effective at center, meshing very well with Oscar Lindberg, who leads the team with seven goals, and Viktor Stalberg, creating an excellent depth line. Keith Yandle will return to Arizona for the first time in his career, playing in Gila River Arena in a Rangers jersey. Yandle played 558 regular season games and 27 playoff games for Arizona, and he ranks fourth on the Jets/Coyotes franchise list four points by a defenseman (311), fourth in assists by a defenseman (246), and sixth for goals by a defenseman (65). While Yandle hasn’t been properly utilized by Vigneault, relegated to the third defensive pairing and surprisingly, the second power play unit, he’s still been very good when he does get the ice time. He is fifth in scoring for New York with seven points, and is tied for the team lead in assists (6). I expect a good game from him. There is no update yet about Rick Nash and his availability. Nash missed his first game of the season yesterday with a strained back, and Emerson Etem played in his spot. If Nash isn’t good to go, Etem would likely remain on the top line. The Rangers and the Coyotes will face off at Gila River Arena at 9 PM. The game will be broadcasted on MSG Network. Posted on November 7, 2015, in Game Previews and tagged Alain Vigneault, Anthony Duclair, Arizona Coyotes, Chris Kreider, Dan Boyle, Dan Girardi, Derek Stepan, Derick Brassard, Dominic Moore, Duclair trade, Dylan McIlrath, Emerson Etem, Jarret Stoll, Jesper Fast, JT Miller, Keith Yandle, Kevin Hayes, Kevin Klein, Madison Square Garden, Marc Staal, Mats Zuccarello, Max Domi, MSG, New York Rangers, New York Rangers blog, NHL, NYR, Oscar Lindberg, Rangers, Rangers blog, Rick Nash, Ryan McDonagh, Viktor Stalberg, Yandle trade. Bookmark the permalink. Leave a comment.